Russia’s recession may get bad enough to cause the unthinkable: Vladimir Putin losing power. The prime minister’s party, United Russia, lost a majority in four of eight regional legislatures in March 15 elections. His approval rating has is still high (73%) according to a state-owned polling agency — but it is at an all-time low (49%) according to an independent group. 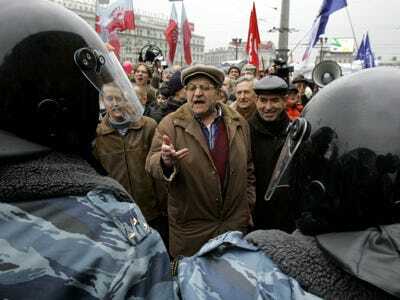 Most striking in authoritarian Russia is an upswell in protests. Some are unsanctioned, or in other words, riots. The biggest rally so far came last month in Kaliningrad, a small Western exclave that has the misfortune of being located just north of Germany, where downtrodden Russians have a clear view onto the heightened living standards of their European neighbours. Some 10,000 people turned out to protest the policies of Putin and the local governor. “In our country, there will be another Kaliningrad,” Nemtsov said. What’s scary is that the most viable challenger to United Russia is still the Communist Party, which has picked up legislative seats and organised protests.